When designing and building a Zero Energy Home or Zero Energy Ready Home, the goal is to have the highest performing building envelope possible for energy savings. If you look at a building as though it is a cube with the sides of the cube being the floor, roof and walls, the walls make up the bigger portion of the building envelope. Therefore, the overall R-Value of the walls can greatly affect the building envelope. Building scientists are finding that window performance is much more important to overall wall performance than previously thought, and carefully selecting and placing windows can increase your overall wall performance with less cost. There are many options for creating better insulated walls, such as staggered stud framing, double walls, or I-joist walls. These all allow for thicker, better insulated walls with a higher R-Value. However, it is important that, when looking at total building envelope, the total wall assembly is taken into consideration, not just wall insulation values. So, you can see that in order to get to the same result (R-23 overall wall assembly), we can either increase the insulation of the wall or we can simply use higher performing window. In most cases, it may be more cost effective to install a higher performing window than to increase the insulation of the wall. Given the same sized window, an increase in wall insulation and R-Value will get you less of a gain on overall wall assembly R-Value. 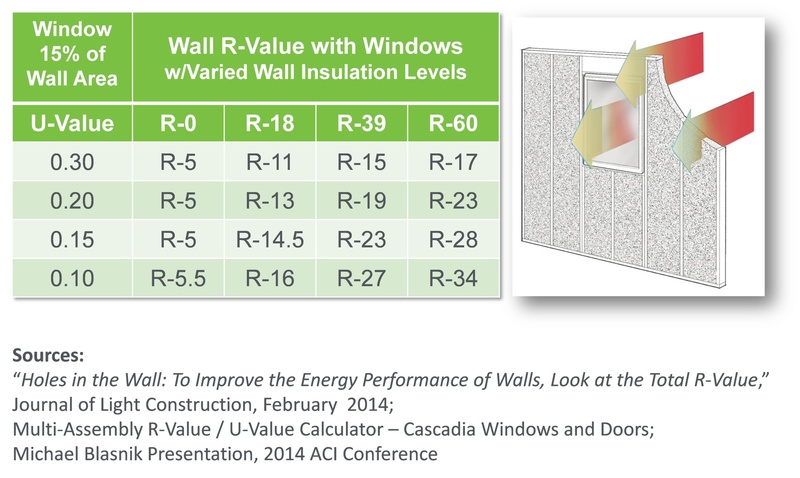 Conversely, a better U-Value rated window of the same size will get you more of a gain on overall wall assembly R-Value. 1. The most cost effective approach is to have the window area be 15% or less of the area of the floor area. A smaller window area can sometimes be achieved by carefully placing the windows for optimal light and optimal viewing. A well-placed smaller window may provide as good of an outside view and lighting as a poorly placed window. 2. Finding reasonably priced, high performance windows can be an optimal way to increase the overall R-Value of the total wall assembly. 3. Good energy modeling can help determine size, placement and performance needed for windows to achieve a high performance wall at the lowest cost. European manufacturers have already been selling high performance windows, but some American window manufacturers are also adopting lower U-Values for their U.S. made products. However, these are hard to find, so hopefully in the future, we’ll be seeing more efficient windows available.